Amidst an apartment boom the likes of which has not been seen before in Melbourne, one could be forgiven for thinking that the humble office tower of yesteryear is all but a distant memory in this city. Lord Mayor Robert Doyle has also weighed in on the topic lamenting the lack of office buildings being developed in the city. This could however not be further from the truth, it would appear the demise of the office tower in Melbourne has been greatly exaggerated. As construction of soaring apartment towers has taken centre stage in the Melbourne CBD over the last 5 or so years the next cycle of office tower construction has slowly yet surely been getting underway in the shadows of the apartment boom. As illustrated in the development summary below, a number of significant projects are set to add well over 500,000 sqm to Melbourne's office market over the next 5 years with most having achieved significant pre-commitments from tenants to allow them to proceed to construction. A point of contention during the planning phase, ISPT received approval for its $110 million office tower which is being developed as the new headquarters for Australian Unity. 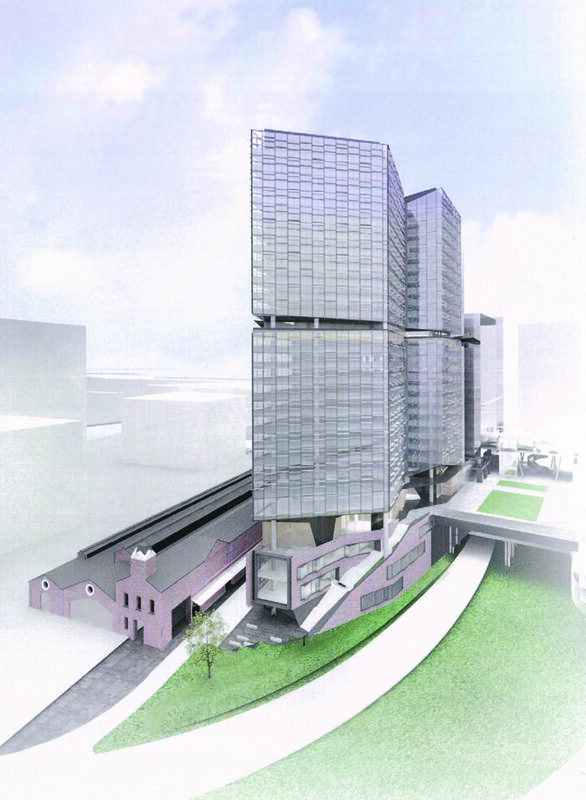 The development seeks to "integrate historical elements into the new boutique office tower." Demolition has commenced on site with the 16 level office building of 15,600 square metres is due for completion in mid 2019. Construction on the 40-storey tower now known as Olderfleet has officially commenced with Mirvac breaking ground on site earlier in the week. Anchor tenant Deloitte will occupy 22,000 sqm of office space upon completion in June 2020. Olderfleet, designed by Grimshaw, has undergone a number of design changes including the flipping of the core from the eastern side to the west and the consolidation of four vertical village modules into three with 'client floors' between each. The building will feature a 30m high atrium connecting the heritage-listed Olderfleet Buildings to the new office tower while also providing sufficient separation between them. This space will include a café and a flexible business centre with meeting rooms on the lower ground floor. The building brings together the latest thinking from our studios around the globe, with an internal design competition held with our London, New York, Melbourne and Sydney studios, each contributing a design for the new building. A single coherent response was developed providing the ideal site-specific design, which celebrates Olderfleet’s significant historic context while supporting Mirvac’s ambition to deliver a leading-edge workplace. Representing one of Australia’s largest mixed-use developments, Collins Arch is located on a 6,000 sqm site at 447 Collins Street just down the street from Olderfleet. Upon completion in 2019 Collins Arch will become the new home for legal eagles Gadens, King & Wood Mallesons and HWL Ebsworth, who combined will occupy 20,000 sqm or just over 40% of the 49,000 sqm NLA office space. They will be joined in the 'Pantscraper' by Melbourne's first W brand hotel and 202 luxury residences all set amongst a 1,500 sqm park. Collins Arch was designed to be a signifier of leading design and instantly recognisable as a statement of Melbourne’s premier status globally. We are pleased to welcome Gadens to Collins Street’s new pinnacle address and, as a law firm committed to positioning itself as a best practice organisation and employer of choice, we are confident Collins Arch will offer the best place to grow and demonstrate these commitments. After a number of false starts, work has finally commenced on QIC's 80 Collins Street project after it signed Macquarie for 6,000 sqm in the 39-storey tower. 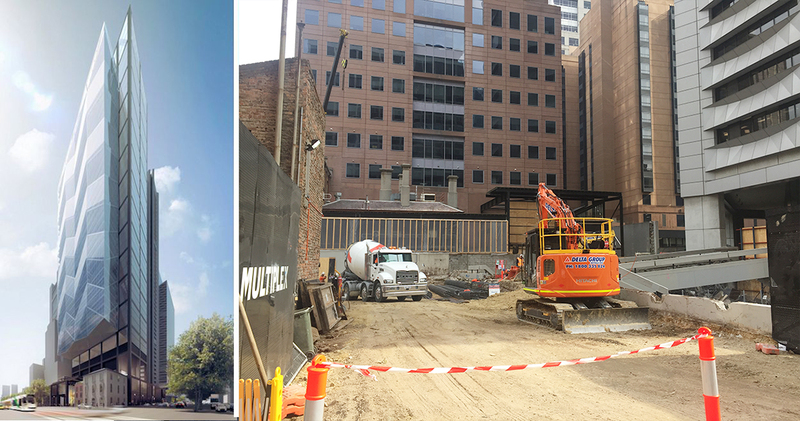 Contractor Multiplex has commenced demolition on site to allow for construction of the tower in addition to 5,800 sqm of retail space and a 250-room SilverNeedle hotel. The new premises for Pitcher Partners recently had both its cores top out with works now progressing on the steel roof structure and facade installation almost complete, with attention now turning to interior fit-out of office spaces. 664 Collins Street provides a through-link from Collins Street to Bourke Street via a public laneway which was built as part of sister building 699 Bourke Street. 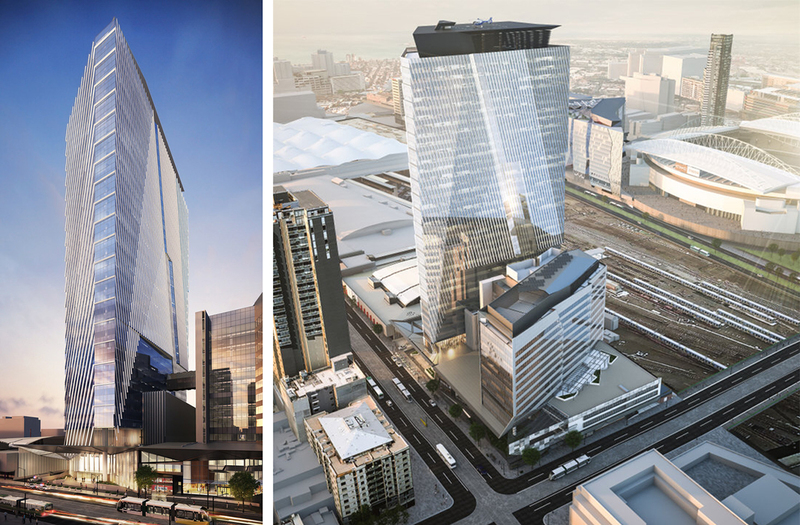 Walker Corporation has brought forward construction of Tower 5, due to strong demand from a number of blue chip corporate tenants including Transurban. Although the name would seem to suggest otherwise the 40,000 sqm building will be the sixth tower and the final stage of the $2.5 billion Collins Square development. Originally completed up to podium level to round out the retail component, construction has now resumed on the faceted tower with completion anticipated for 2018. The new home of Arup in Melbourne, One Melbourne Quarter is progressing at a rapid pace with the core now rising above Collins Street. The 13-storey building comprises 25,543sqm NLA of office accommodation in addition to ground floor retail and has been designed by DCM) with typical floorplates of 1,970sqm. 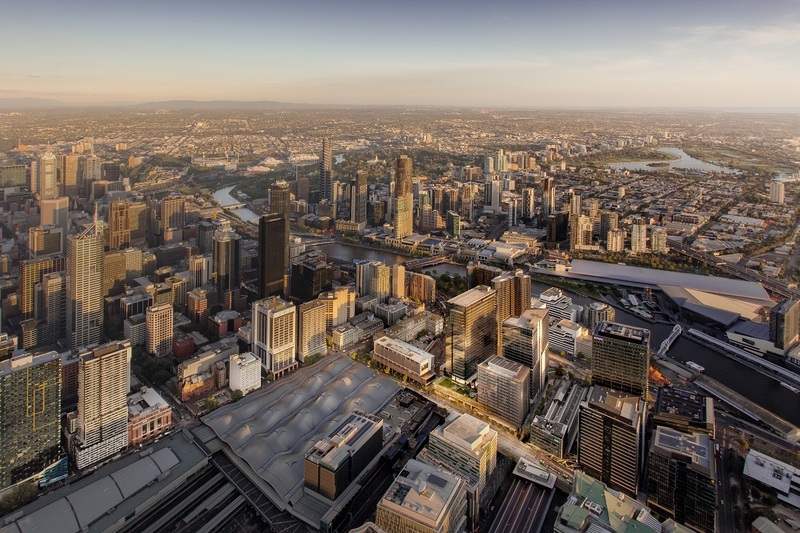 One Melbourne Quarter is targeting completion for Q3 2018 and will deliver stage one of the elevated Skypark to Collins Street. Lendlease's new $430m office building for ANZ is flying along with crane base installed and core formwork not too far off. The site at 839 Collins Street will become a 21-storey office tower featuring 38,000 square metres of A-grade commercial space. And depending on how it fares at planning, the project may also include a skybridge linking the new building to the existing ANZ global HQ at 833 Collins Street, although the bridge has thus far been met with stiff opposition from the City of Melbourne. Another one of those projects that has been around for what seems like forever, work is finally set to get underway on Brookfield Property Partners' $800m 405 Bourke Street development after it signed National Australia Bank as the anchor tenant. NAB will occupy all 29 office levels in the 66,000 sqm development, which will rise above above three levels of retail. 405 Bourke will employ a side core configuration allowing for open-plan workspace ranging up to 2,350 sqm. Cbus Property has appointed Probuild as the Preferred Contractor to construct a purpose built facility to accommodate Victoria Police's new headquarters at 311 Spencer Street. The 39 -storey, 65,000sqm commercial tower will include a purpose built fit-out to Victoria Police requirements that will increase efficiency and improve law enforcement in Victoria. The development is a joint venture between Cbus Property and Australia Post. The tender process was extremely competitive. Probuild was chosen because we have the technical capability and resource capacity to successfully deliver major projects in Victoria.This construction is of major significance to Victoria and the commercial building industry. We are thrilled to be working with Cbus Property and Victoria Police to deliver such an important project. Probuild expects to begin site works mid-May 2017, with work expected to be completed by the end of 2019. The future stage of Charter Hall's Wesley Place development known as Wesley Upper Lonsdale Tower which is planned for a later date at 22-storeys 15,000 sqm. 140 Lonsdale Street is awaiting planning approval. Charter Hall purchased this future development site which currently houses the offices of VCAT in 2016 for $78.5 million. The site neighbours the vacant 22,000-square-metre 555 Collins Street and early renders suggest that Charter Hall are considering a 27-storey tower office tower of NLA 27,700 sqm. Urban Melbourne has previously covered this site as part of a study in consolidating 55 King Street with the adjoining 555 Collins Street. You can read about it here. Approved by Planning Minister Richard Wynne in March, Melbourne Quarter Tower will be located at 693 Collins Street, injecting almost 55,000 sqm of office space into the precinct across its 28 floors, in addition to approximately 2,500 sqm of retail space. It is one of three DCM designed office buildings within Lendlease's Melbourne Quarter development. Two MQ is a 29 level commercial tower above ground, which includes 4 levels of basements and retail, main lobby level, 2 levels of plant space and 23 levels of commercial space. 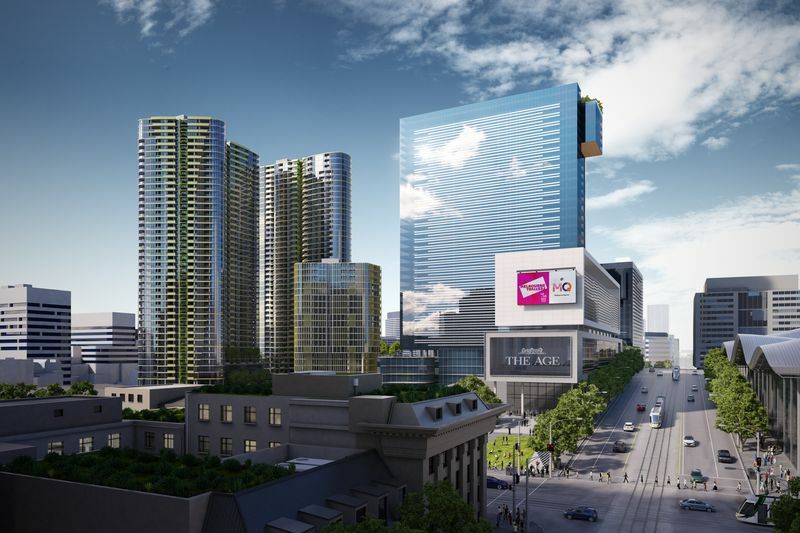 Two Melbourne Quarter will be the third of a total of three "next-generation commercial towers" to be built at Melbourne Quarter, joining the already under construction One Melbourne Quarter at 695 Collins Street and the recently approved Melbourne Quarter Tower. Combined these three will deliver around 130,000 sqm of office space into Docklands and help better connect it to the CBD. Great summary, LD. Interesting how the biggest of the laggards (80 Collins/405 Bourke) look like going up together. Lost count of the times I've driven past 80 Collins, wistfully looking for any sign of a start. Re: Wesley Place: "... All valuable heritage buildings will be restored and adaptively re-used to ensure that their historic value is appreciated by all". Really? I thought the developer had just demolished one of the most "valuable" sites for women's history in Melbourne - the Princess Mary Club. Cox Architecture - why don't you just say you don't regard this heritage building as "valuable" and all the history of the women who benefited from it over the 20th century, and leave the rest of us out of it. Your comments are disingenuous propaganda unbefitting of the profession. Good summary of what's going on in the Melbourne saga. Princess Mary is indeed a terrible loss. My understanding was the Princess Mary Club building had an essentially 'terminal' case of concrete cancer making repair/retaining the building unviable. Could anyone confirm? Buildings are not living things, so the idea of any damage being "terminal" is not a very helpful metaphor. All old buildings need repair and restoration work - with varying levels of expense. 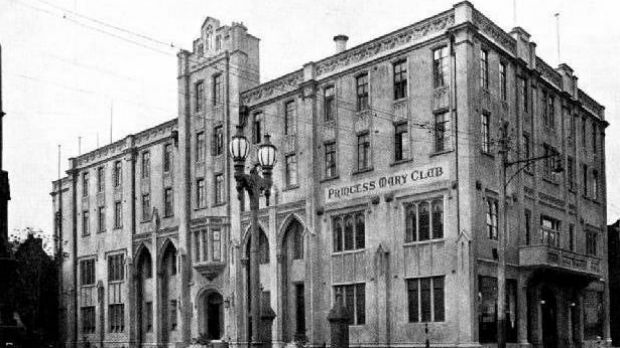 No one questions that the work would have been relatively costly to undertake, but given the profits from developing the site, a compromise could have been reached where the church (and perhaps the developer) contributed a percentage of that towards repair work for the Princess Mary Club. A valuable historic building like this was certainly worth repairing - and the technology and skills to do it certainly exist in Australia - it's just that the will to do so wasn't there. I realise that, hence the quotation marks. In fact if we're talking about not very helpful, your nitpicking and lack of comprehension is exactly that. I made it very clear that I was asking about the viability (see I used the word 'unviable') of retaining the building. Which is a question you've not answered. Yes, it was a viable restoration - hence the links to expert concrete cancer restorers. It's not nitpicking to raise an issue with language here - so many times great heritage buildings are destroyed because of claims like this. We often here the same old claims, that the building was "...not structurally sound" or "in terminal condition" or "too far gone", etc, etc. Yet, there are many effective techniques available to salvage, restore, stabilise and repair old structures. In this case, we had a very significant early 20th century concrete building in a state of decline. But with contemporary techniques - treating the rust, resin / epoxy injection and so on - we could now be looking at a beautifully restored Princess Mary Club. Instead, the owners have gone for the cheaper option of demolition, rather than the viable, but more expensive option of repair and restoration. You could just as easily ask if it is "viable" to restore Flinders Street Station's ballroom? If you mean, is it financially "viable" then probably not. Is it still a good idea, from a cultural and civic standpoint? Absolutely. How do you know it could have been a viable restoration? Maybe the cost of repair was more than the value of the building in the first place. Just because you post a few web links means nothing. You continue to fail to grasp the notion that unfortunately 'money makes the world go round'. I didn't make it that way. It just is. Your unfathomable inflexibility as well as your simplistic and idealistic views, though commendable and passionate, mean very little in the often cutthroat real world. well we can blame the church and Council either way. The church owned it and allowed it to get very run down and then entered the development agreement that has led to its demolition. Council sat on its hands on heritage for 20-30 years and hasn't appropriately protected sites like this and even their most recent heritage review missed the mark in my opinion. Well, that's a fair account, John. And thanks for the lecture on simplistic views, Dean!